To Cite: Goodarzi Z, Karami E, Ahmadizadeh M, Ahmadi Angali K. The Effect of Simvastatin on Sodium Dichromate-Induced Oxidative Stress, Jundishapur J Health Sci. 2014 ; 6(4):e23463. doi: 10.5812/jjhs.23463. Background: Hexavalent Chromium (CrVI) is used for various industrial applications. This chemical agent can cause inflammation and induce numerous human diseases, including severe damage to the liver and lung. Simvastatin (SIMV) is widely clinically used for lowering hypercholesterolemia. This agent also has anti-inflammatory, anti-oxidant, and anti-thrombotic effects. Objectives: The aim of the present study was to investigate the role of SIMV on sodium dichromate (Cr VI)-induced oxidative stress in rat. Materials and Methods: Sixty-four adult male Wistar rats (180-220 g weight) were randomly assigned to eight groups (n = 8). Group one received SIMV 20 mg/kg/day. Group two was given vehicle only. Groups three, five and seven received intraperitoneally (i.p) sodium dichromate at doses of 8, 12 and 16 mg/kg BW (Body Weight) for eight consecutive days, respectively. 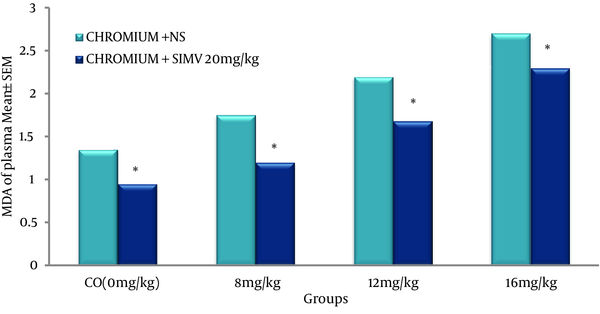 Groups four, six and eight pretreated with the 20 mg/kg SIMV 30 minutes to prior administration of sodium dichromate in a doses of 8, 12 and 16 mg/kg, respectively. The experiment repeated for eight consecutive days. Twenty-four hours after the last administration, animals were killed with overdose of sodium pentobarbital. Blood was collected for determination of malondialdehyd (MDA) and glutathione (GSH) levels. Results: The level of GSH significantly decreased. In contrast, the plasma level of MDA significantly increased in a dose dependent manner in CrVI-treated rats, when compared to control animals. SIMV had no effect on the biochemical parameters when compared to control rats, but significantly increased GSH concentration and decreased MDA level in CrVI-treated rats. Conclusions: This finding suggests that SIMV may have a protective effect against CrVI-induced oxidative stress. Chromium compounds are widely used in industrial and chemical processes such as tannery, stainless steel manufacturing, welding, paint and pigment producing, metal finishing, and wood preservation (1). Occupational exposure to hexavalent chromium induced adverse effects on health and also chromium compounds are highly toxic and induced dermatotoxicity, immunotoxicity, neurotoxicity, genotoxicity, carcinogenicity and nephrotoxicity (1, 2). Hexavalent chromium compounds include ammonium chromate, calcium chromate, potassium chromate, potassium dichromate, and sodium chromate can generate reactive oxygen species (ROS) during its reduction in successive oxidation states, which are well known to produce toxic effects and excessive quantity of ROS generated by this reaction. Reactive oxygen species can cause injury to cellular proteins, lipids, and DNA leading to astute known as oxidative stress (3, 4). In fact, hexavalent chromium is rapidly reduced by extracellular body fluids (such as saliva, gastric juice and epithelial-lining fluid, and in nontarget cells including pulmonary alveolar macrophages and red blood cells) to inactive chromium III (4-9). Chromium hexavalent can be reduced by biological reductants including glutathione, cycteine, ascorbate, hydrogen and flavor enzymes such as glutathione reductase and selectively inhibit the activity of glutathione reductase (10). Hexavalent chromium can permeate into red blood cells and bound with hemoglobin and lymphocytes, and stay longer in the body; therefore, it may provide a marker of long-term exposure. A little is known about chromium uptake in white blood cells (WBC) (11, 12). On the other hand, administration of hexavalent chromium to rat caused severe progressive proteinuria, urea nitrogen, and creatinine, as well as elevation in serum alanine aminotransferase activity and hepatic lipid peroxide formation (13). Chromium - particularly in the hexavalent form - is considered to have sever toxicity and long-time-exposed individuals can develop tissue necrosis (14). The adverse effects of ROS are balanced by the antioxidant action of non-enzymatic antioxidants in addition to antioxidant enzymes. The role of oxidative stress in injury associated with hexavalent chromium exposure suggests that antioxidant supplementation may mitigate chromate-induced toxicity (15). Statin compounds reduce inflammation by taking action in many cells (16) and HMG CoA reductase inhibitors (statins) promote reduction in plasma levels of low-density lipoprotein (LDL) cholesterol (17-20) and it is also suggested that statins promote systemic antioxidant effects through the suppression of distinct oxidation pathways. This study aims to assess the effect of simvastatin on chromium hexavalent induced oxidative stress in rats. Group one: rats were treated (oral gavage) with SIMV at dose of 20 mg/kg BW/day, for 12 days. Group two: used as controls (given vehicle, normal saline). Groups three, five and seven were received intraperitoneal (ip) sodium dichromate at doses of 8, 12 and 16 mg/kg BW/day for eight consecutive days, respectively. Groups four, six and eight were pretreated with SIMV (20 mg/kg BW, oral gavage) four days prior to administration of sodium dichromate (8, 12 and 16 mg/kg BW/day) for eight consecutive days, respectively. Twenty-four hours after the last treatment, all rats were killed with overdose of sodium pentobarbital. Bloods was collected for determination of malondialdehyd (MDA) and glutathione (GSH) levels. Lipid peroxidation in blood was estimated calorimetrically by measuring thiobarbituric acid reactive substances (TBARS) by, Ogungbenro and Yagi (21, 22). Blood samples with EDTA were centrifuged at 4000 rpm for five minutes. Plasma was collected for analyses (23). Then, 1 mL plasma were collected into a 10 mL tube and 2 mL of thiobarbituric acid reagent was added. The tubes placed in vortex-mix for 10 seconds and then in boiling water bath (90-100°C) for 20 minutes. After seven minutes, the resulting supernatant was removed and measured at wave of 532 nm with the use of SERIEC-7000 spectrophotometer. Malondialdehyd concentration was determined by using 1, 1, 3, 3-tetraethoxypropane as external standard (0.5-2.5 µM). The GSH concentration was measured with DTNB by Ellman’s Method (24). For measurement of plasma GSH, 2.3 mL of potassium phosphate buffer 0.2 M with pH = 7.6 was taken in the test tube and 0.2 mL plasma was added. Then, 0.5 mL DTNB 0.001 M was added to the plasma solution. An absorbance of reaction product in the cuvette was read after five minute at fixed wave of 412 nm with the same spectrophotometer and GSH level was determined and 0.2-0.8 mM solutions were prepared from 1 mM GSH stock solution for drawing standard curve (Figure 1). The data were analyzed using SPSS 16.0. Data were analyzed by using One-way analysis of variance (ANOVA), followed by post hoc analysis with LSD test. Probability value of ≤ 0.05 was determined to be statistically significant. 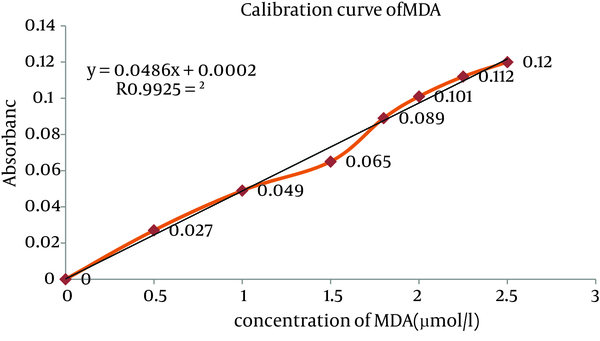 Standard curve of MDA was obtained as shown in Figure 2, and the level of lipid peroxides was expressed as µmole of MDA (21, 22). Concentration of MDA in the plasma was significantly increased in dose dependent manner in the chromium treated animals when compared to the control group (Figure 3). However, pretreated rats with 20 mg/kg/day of SIMV significantly (P ≤ 0.05) decreased the level of MDA in chromium treated animals, when compared to group that pretreated with vehicle (Figure 3). Figure 2. Effect of Simvastatin on MDA Level in Rat Plasma Treated With Chromium at Doses of 0,8,12 or 16mg/kg. * Difference Is Significant (P ≤ 0.05). 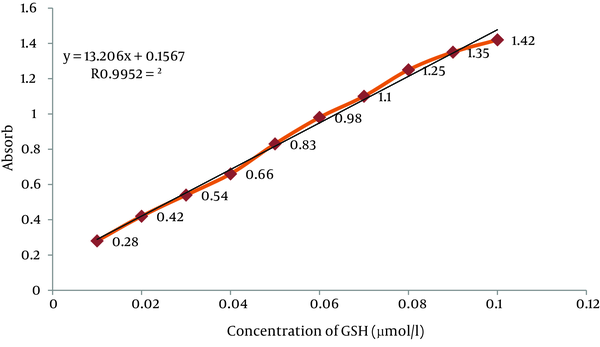 Standard curve of GSH was obtained as shown in Figure 1, and the level of GSH was expressed as µmole of GSH. Concentrations of GSH in the plasma in chromium-treated group were significantly decreased when compared to the control value. However, administration of single dose of SIMV (20 mg/kg/day) significantly (P ≤ 0.05) increased the level of GSH in chromium-treated rats when compared to non-pretreated rats (Figure 4). The results of the present study indicated that the level of GSH significantly (P ≤ 0.05) decreased in rats treated with various doses of chromium VI when compared to those in control group. The depletion of GSH was noted in a dose-dependent manner. Curello et al. found that Plasma GSH plays a crucial role in the detoxification processes of electrophonilic metabolites of xenobiotic and oxygen free radicals, such that release of reduced and oxidized glutathione into the plasma is considered as a reliable index of oxidative stress (24). Mohamed and Saber showed that injection of potassium dichromate, subcutaneously, cause GSH depletion (2). Our findings show that ip injection of various doses of sodium dichromate significantly (P ≤ 0.05) increased MDA levels in rats plasma when compared to non-treated animals (control). similarly, Sai Ram et al. expressed that Chromate significantly enhanced plasma and tissue MDA levels (25). Geetha et al. 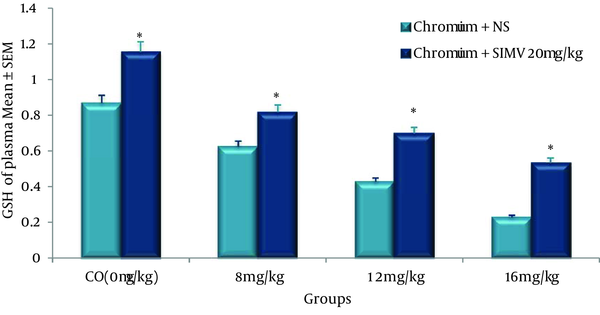 reported that chromium 6-induced oxidative stress in rat serum (26). Arivarasu et al. found that potassium dichromate produced oxidative stress in rat small intestine of rat (27). Ogungbenro found that K2Cr2O7 significantly (P ≤ 0.05) enhances oxidative stress and the course of apoptosis, possibly through oxidative stress and mitochondrial damage (21). Soudani et al. concluded that exposure of rats to chromium, promoted oxidative stress with an increase in MDA and a decrease in glutathione (GSH) levels and also a decrease in antioxidant nonenzymatic levels such as glutathione, nonprotein thiol and vitamin C (28). Although the mode of action Chromium VI (CrVI)-induced toxicity is not completely understood, but sufficient evidence demonstrated that it may be related to oxidative stress including reduction of the level of GSH. SIMV is widely used clinically for lowering hypercholesterolemia and this chemical agent has significant effects on numerous measures of inflammation, immunity and oxidative stress (28, 29). The present data indicates that the daily oral gavage of 20 mg/kg SIMV reduced the level of plasma oxidative stress, especially in groups received high dose of CrVI. It has been suggested that statins possess antioxidant properties by increasing the NO bioavailability, reducing lipid peroxidation and ROS production (30-32). The results of the present study indicated that SIMV ameliorates chromium toxicity as indicated by elevation of GSH level and depleted lipid peroxidation, when compared to those pretreated with vehicle. Maheshwari et al. Found that statins reduced cisplatin-induced nephrotoxicity in rats (32). Similarly, Jabbari et al. reported that SIMV protected rat kidney against gentamicin-induced nephrotoxicity (33). Fouad et al. reported that SIMV is one of the antioxidatve drugs, which have SIMV treatment ameliorates injury of rat testes induced by cadmium toxicity (34). Stoll et al. expressed that antioxidant effects of statins likely contribute to their clinical efficacy in treating cardiovascular disease as well as other chronic conditions associated with increase of oxidative stress in humans (35). Ramanjaneyulu et al. observed that that atorvastatin offers a significant protection against DOX-induced oxidative stress and DNA damage in the heart and testes of mice (36). The results of the present study demonstrate that SIMV at a concentration of 20 mg/kg protected the animals significantly (P ≤ 0.05) from the chromium induced oxidative damage. The present study supports the view that statins not only protected drugs induced oxidative stress, but also may be useful against oxidative stress induced by industrial chemicals. In conclusion, CrVI produced dose-dependent toxicity and SIMV had potential to ameliorate CrVI toxicity by its antioxidant property. The source of data used in this paper was extracted from the master thesis of Zahra Goodarzi, student of Occupational Health engineering Department, School of Health, Ahvaz Jundishapur University of Medical Sciences, Ahvaz, Iran. Authors’ contributions: Zahra Goodarzi was responsible for doing the project (related to her MSc thesis); Esmaeil Karami was technical assistance; Massumeh Ahmadizadeh, supervised the project; Kambiz Ahmadi Angali was responsible for data analyses. Funding/Support: This study was supported by physiology research center and the research deputy of Ahvaz Jundishapur University of Medical Sciences (Grant NO.PRC-151).